Portline, being the address for airport advertisement since 1999, operates in the field of marketing for indoor/outdoor advertisement spaces at exclusive domestic and international airports. Being the marketer of advertising channels at leading airports, Portline added airport digital advertisement areas to its portfolio. Aviation industry having a big passenger number increase and growth with the positive developments observed in civil aviation sector, became an indispensable course of advertisement for the brands aiming to reach masses. Between 2003 and 2014 number of passengers transferring from airports has increased by 349%. While total number of passengers travelling by air was 165.968.041 in 2014, number of passengers in terminals whose publicity rights were held by PORTLINE constituted 86% of total passenger number. 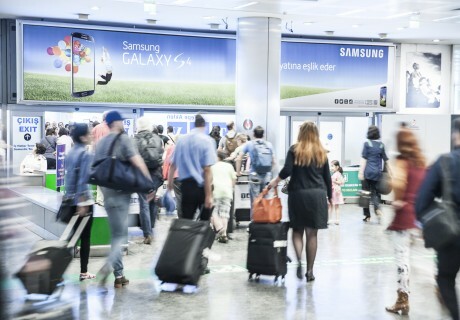 PORTLINE offers effective advertising opportunities for brands targeting to reach middle and upper socio-economic group audience with stand areas and other exclusive advertisement applications besides more than 600 world standard panels and 1.721 CLP faces at most prestigious airports in Turkey. PORTLINE brings together high standard course of advertisements and domestic and international brands at the terminals spread over Turkey like Istanbul Ataturk Airport one of Europe's most modern and busiest airports, Ankara Esenboga Airport with a strategic importance as a gate of protocol and diplomacy, Aegean Izmir Adnan Menderes Airport hosting extremely important centers in terms of history and tourism, and Sabiha Gökçen Airport Istanbul's second airport. PORTLINE bringing dynamism to the airport course of advertisement with innovative and solution-oriented approach thereof renders service at Istanbul, Ankara and Izmir offices. Besides being strong and effective for brand communication, airport advertising provides efficient mediums allowing you to reach millions of domestic and international passengers.